When Bud Spencer is relishing a triple hamburger with a beer and a whipped cream cake or when he is sleeping peacefully inside his truck after a long drive on a hot day, you simply leave him alone. Otherwise, you would be in the wrong end of a blow that could twist your nose eastward. Permanently. Just like those moronic villains in the movie, who, after receiving that old-fashioned thump on their head, stagger away and crash onto a pinball machine, eyes rolling. 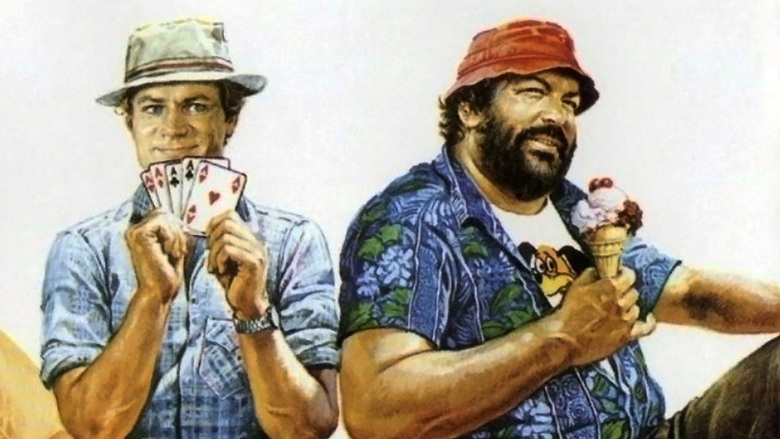 Odds and Evens, a rare gem from the Bud Spencer-Terence Hill collection, asserts why they had been a great duo for so many years. Their self-styled approach to any character thrills you no matter how much of a film pundit you are. They are so charismatic that scripts have to be written for them. And that’s one magical aspect of cinema that has made it sustainable over the years. Not all times do you put your feet up on the couch to watch an intense, hard-boiled story that bends your mind. Johnny Firpo, played as always with supreme agility by Terence Hill, is appointed by the Navy Chief to conduct a crackdown on a gambling mafia, which is threatening the growth of Navy sports. He goes undercover and teams up with Charlie Firpo, played by Bud Spencer, a gambler turned truck driver, since the latter knows the ropes better. What ensues is a rollicking set of sequences, right from the moment a goon interrupts the big Firpo savoring a delicious bowl of beans and onions and gets his skull broken by the same pan. It is a complete package with boisterous fist fights, effortless glances, groovy music, goofy villains, game sequences, and some gorgeous locale in the tropical side. Odds and Evens is full of tiny little surprises like a truck driver who raises a dolphin in the trailer and flirts with a nun, and a man of herculean stature working as a soft ice-cream vendor getting mixed up on the menu, and an innocent cafe owner who saves his orange-squeezer during a brawl, and a poker-faced goon who loses a tooth on every punch on his face. And all such tiny things will blow your worries to smithereens.